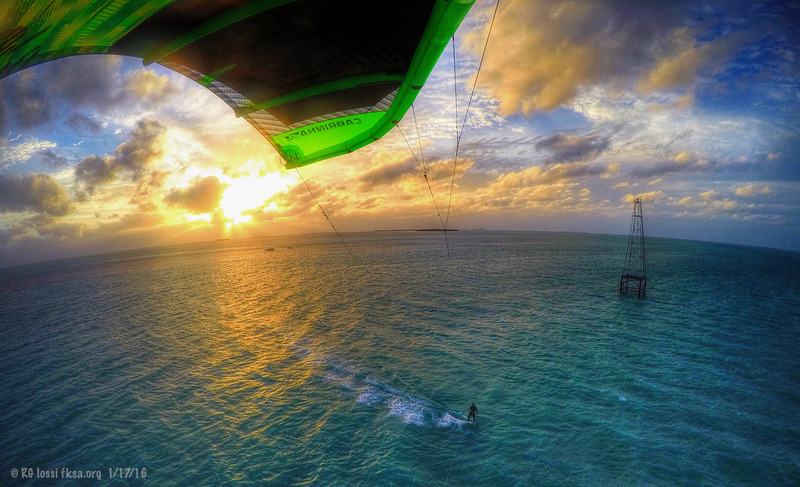 I was able to shoot down to Key West for about 24 hours, a few days before Christmas for some kiting. There was a strong cold front moving through pushing chilly air and westerly offshore winds with it. Usually things are warmer in the lower Keys, just not this time! Most of the images below are from the new GoPro3 Black camera just released. I hit a spot in the Lower Keys on the way down at sunset on Friday. Winds were in the lower 20 kt. range and air temperature was in the 60's. Nippy in short. Made it to Key West later on that evening. It was just a few days before Christmas with lots of decorations up around the island. A few shots will be spread through the other images inspired by the season. I moved through KW shooting some of the excellent Christmas directions on the fly with an iPhone 5. I've included them here to add a sense of the season. Skot maintains a bunch of Cabrinha kites and Xenon kiteboards onboard which can help in variable wind conditions. I made good use of the large Cabrinha Plasma when the winds dropped a bit. That is the hydraulic ram anchor attached to the starboard transom. Pretty impressive device for shallow water anchoring. Skot just thinks this stuff up, designs it himself at times or selects something off the shelf and puts it together. Christmas in three more days and the island is all lit up! They have a very nice solar powered air compressor onboard for filling kites in no time. Upwind Kiteboarding runs sea taxi to abundant but largely out of the way flats locations around the island. They aren't readily accessible by kite from shore, at least not reliable roundtrip runs, whoops. He knows the spots and tricky means of access through the shallows to knee deep flats kiteable in winds from all directions. Great for learning, training for that new trick or just riding in butter conditions. No waves to speak of, shallow and usually fairly warm. The temperature was in the low 60's this day and after about five hours I was cooling down in a 5/4 mm full suit with a heat seeker top on. The guys were telling me that clients from the north sometimes make the mistake of underestimating how cool things can get after hours on the water in lower temperatures in strong wind. Hint: ask about whether you need to bring or rent a wetsuit. Skot Scott seems to be a guy who is always thinking and better still acting on what he thinks about. Case in point, some years back he was kiting off Cape Hatteras. He was using a buoy secured to a danforth anchor to serve as a kite launching and landing holdfast. He was about to head out when he saw a guy come up with a type of flat kite that he knew bounced excessively. He specifically warned the guy NOT to use his anchor setup to land his kite. I think he even repeated it. Anyway, Skot headed out and in a short time a guy was furiously waving him in. He headed in and the guy said, "your friend needs to go to the hospital immediately as he is seriously hurt." Skot asked "what friend?" Turns out the guy with the bouncing kite ignored Skot's instructions not to try to land his kite using his anchor. The guy had secured his chickenloop to the buoy and was walking down the lines to his kite when the kite slingshotted the anchor at him seriously impalling a fluke into his calf? Ouch! Skot got the guy sorted out but thought there had to be a better way. In time, he created http://www.kiteanchor.com/ and has been manufacturing it and distributing it worldwide for some years. By the way, Skot isn't into armed kiting robbery or anything, it gets nippy out on the flats in a strong cold front in time. So, he was wearing something made for fishing to protect against sun and wind burn. I understand he has some ideas to improve that concept too. Kites parked very nicely using the kiteanchor. Skot secured four kites, two forward and two aft of the boat using his anchors, quick and clean. There is a story behind this board. Lloyd Northrup III, sadly departed, shaped my favorite board years ago but it was being repaired by Donald of Bird Surfboards at this time. I recalled a board that Shannon Best gave me some years ago. He had won it at the 2006 Velocity Games in Texas and passed it on to me to do something with it. It had the signatures of all the competitors on it including other world famous kiters. It occurred to me there were very few of Lloyds special boards left around and I suspect he would have preferred his board to be used rather than collect dust on display. So, I used it. There was the remains of a commercial fishing boat nearby. Not sure if it burned to the waterline and inverted or what. It was very popular with the seagulls being the only dry surface for some miles around. Skot boosting shot with an iPhone. I discovered the phone shoots faster than my Canon G12 camera? Showing off the solar array on the Upwind Kiteboarding boat, "Solaris"
Paul Menta's Amigos Tortilla http://www.amigoskeywest.com/ restaurant at the SW corner of Duval and Greene St. opposite Sloppy Joes Bar in Old Town Key West. It is a regular stop everytime I am on the island. Good quality food complete with life preservers with each bar stool. What more could you ask for? There is a samba dancer now at Mallory Square. i was impressed by her outfit considering most were bundled up against the cold. Pumping out a lot of calories! See you from Key West, hope your Holidays went very well! Next time you're down on Bone Island for some wind time, why not book a trip with Skot's Upwind Kiteboarding? He runs an impressive operation. Last edited by RickI; 05-06-2016 at 09:29 AM. That looks like an awesome little set up. Ive gone out to the sand bars when living there but never got a chance to kite. I'll have to get with them, heading back down this week!